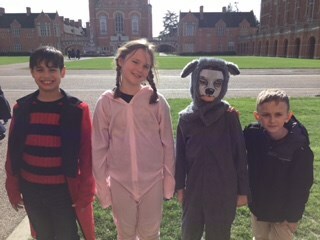 This week Felix J, Ella, Pranav and Luis were lucky enough to take part in a Maths challenge held at Christ’s Hospital. Before the challenge started they were able to witness the famous parade and even caught up with a few of Copthorne’s ex pupils, including Ben K, an old Head Boy at Copthorne, and Jamie H who carried one of the banners on the parade! After the parade the challenge started and throughout the afternoon all pupils took part in various mathematical problem solving activities, from making the number 24, to dominoes and tangrams! A great afternoon was had by all and Copthorne came a very worthy 8th and 18th place overall in their pools, out of over 60 schools, with Ella and Pranav actually achieving the same points overall, as the runners up in the second pool! Well done to all of the four pupils who took part today and what a great experience for you all!